36 degrees Celsius is not that hot but it makes sitting in a blind rather uncomfortable. 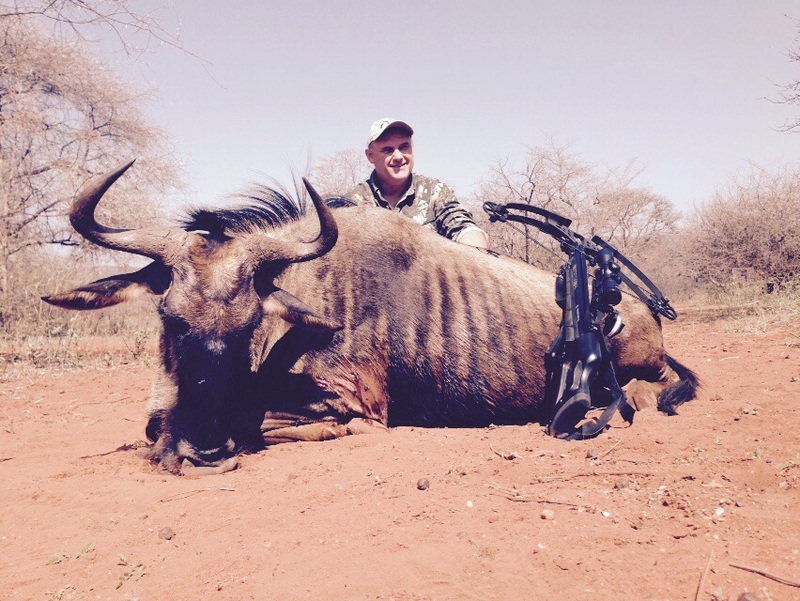 Our hunting party hunted near Tolwe, a small town in Limpopo close to the Botswana boarder. The area is very hot, dry and without surface water, all the water is pumped into the watering holes via a borehole. As you can imagine, you would expect them to be as busy as a shopping mall. As we turned off the tar onto the dirt, I could not wait to see what the 4 days would bring. I had my wife, daughter and 2 jack russell’s in the truck. Having hunted this this concession before, I arrived approximately 4 hours before the clients. Of the four clients, one had 6 years experiencer, another about 3 years and the final 2 where new to the bunting world coning from a rifle background. After they arrived, I settled them into their rooms to prepare for the coming hunts. We headed out to the shooting range to check all the equipment was all in order and the broad heads where flying true. 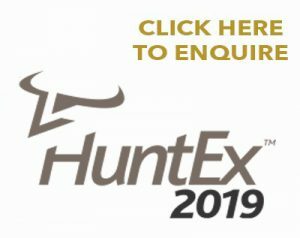 The client that was on his first bow hunt was using a striker crossbow and it shot just fine at 20meters the other gents where equipped with a Bowtech CPX(70lbs), RPM (70LBS) and a Hoyt (60LBS I cannot remember the model). Having 3 ground blinds and 1 elevated blind, we covered all the water in the area. The first afternoon we had the guys in the blinds by 3 pm and they sat until sundown. When we collected them there was no real great news, all the animals seemed to have drunk during the day. I have shot hundreds of animals with a rifle but when I was aiming at this one I heard a thumping in the background and realized it was my heart. He had a touch of “bok koors” or “buck fever”. We took the spoor and following the blood found the female Blue Wilderbeest about 60M from the blind with a perfect heart shot. We set up for a few photos and spoke about what happened you could see how exhilarated he was and could not wait for another chance. We put him back into the blind and left the area taking the animal to the camp. It was now almost midday and it was getting hot. 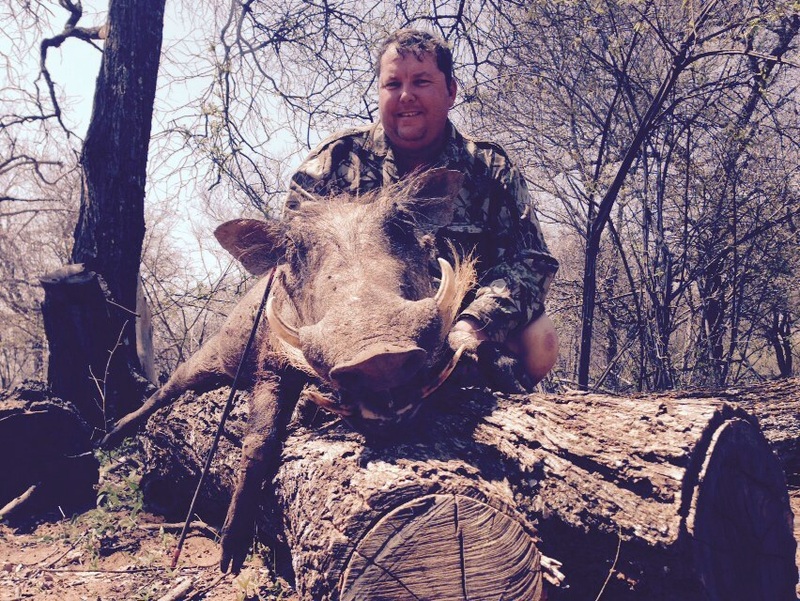 At about 12:30 we got another call from the client that has been bow hunting for some time, he had shot a warthog sow. We arrived and heard the story and found the arrow. In that red sand the blood easily disappears and can be very difficult to follow we found the pig 50 meters from where it had stood, and again a perfect double lung shot. We took a few photos and left the client back in the blind. That afternoon when we collect the guys from the blinds they had seen some interesting sights a few big Kudu bulls passed by but no-one could get a shot off and lots of baboons and they alluded the arrows as well. After the evening meal and a few ice-cold beers around the fire the plan was set up for the next day. Walk and stalk seemed not to be on anyone’s menu so I scrapped the idea as the guys didn’t yet have the confidence yet and I think the bush is so think they were a bit weary about getting a shot at all. The plan was get back and sit until 2 pm come back dive in the pool eat a snack and get back. One of the guys also needed to leave then as well. The next day it was hot I think even hotter than the days before and the blinds were still very quite. After having the guys in the blinds early we got a call at 11am the one gent had shot another pig off we went and repeated the procedure. Find the arrow and take the spoor. We found the pig had been hit with a perfect heart shot again the man with the RPM and a few more years of experience of the rest had done it again. How ever while the pig was in flight and on a death run it runs over all the bushes in its way except the one we found him in I think it was just too much for it as it was stuck in the bush all four hooves off the ground, well it was quite something to see. By this time it was hot and all the gents where in the blind still trying their best. 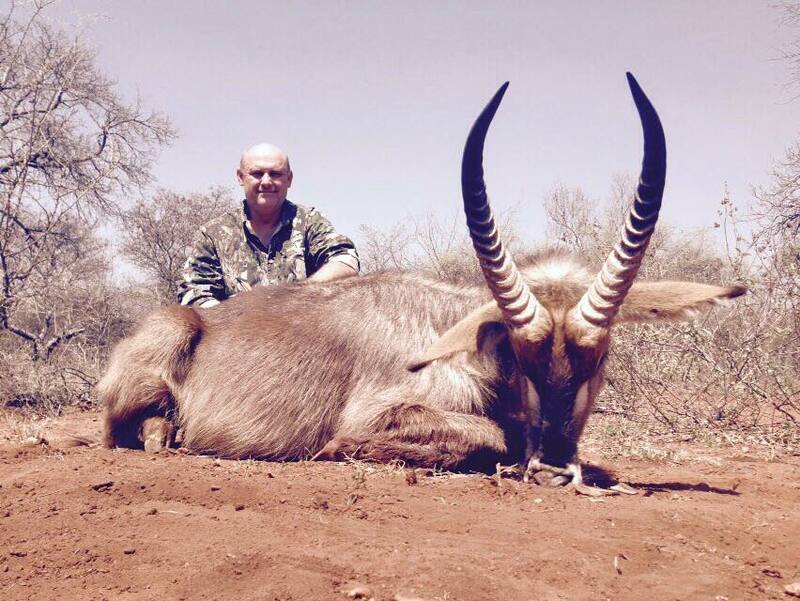 Just before collection time the same novice hunter calls me up and says he has shot a waterbuck. We arrived to hear the story again about the hear beat in his ears and how the excitement was absolute bliss. The bull stood in the water and took a bolt through the shoulder perfectly broad side. We found him not 50m from where he stood again a perfect heats shot the training seemed to be paying off after the photos we collected the rest of the gents and headed for camp. The heat was oppressive and we all ended up in the pool and waited it out until 3 pm when we put the guys back into the blinds. At twilight when I collect them the story was the same animals where coming in and out but no mature animals all female and juvenile animals they saw Impala, Bushbuck, Kudu and Duiker to mention but a few. The evening was spend after an exquisite dinner telling jokes and hunting stories before the gents hit the hay. The following morning it was the normal final day rigmarole, we got the guys packed and loaded their meat for them made sure all the paper work was in order and wished them a safe journey. After I packed the truck and loaded up it was hot again and we sauntered off towards Bernard’s farm for the rest of the weekend. Next up is a buffalo hunt, but not any buffalo hunt. Petrus’s birthday present from his wife is a buffalo and looking forward to guiding one of my very good friends and colleagues.